in Our Despatie family has a long history in Quebec, Canada dating from the mid 1600s and lasting some 250 years until the 1890s, when the first Despatie in our line moved to the United States. According to some sources I have found, the Despatie name and its various spellings (Despatits, Despathy, Despaty, Despatis) was invented in Canada and therefore would not actually trace back to France. This research notes that our line originally carried only the last name Forget, and the coat of arms at left is for this name. The origins of Forget come from the Old French word ‘forge,’ which indirectly denoted a person working as a blacksmith. One theory I have heard is that there were two early families in Quebec with the last name Forget, and one of our ancestors added ‘Despatie’ to distinguish our line from the other Forget family. In contrast, a Despatie cousin (thanks Guy!) notes that ‘Despatie’ does in fact come from France. The explanation is that the original spelling was Des Patis (a ‘Patis’ is a poor pasture) and that the original last name of our immigrant ancestor was Forget dit Des Patis, which is loosely translated as (blacksmith from the poor pastures). 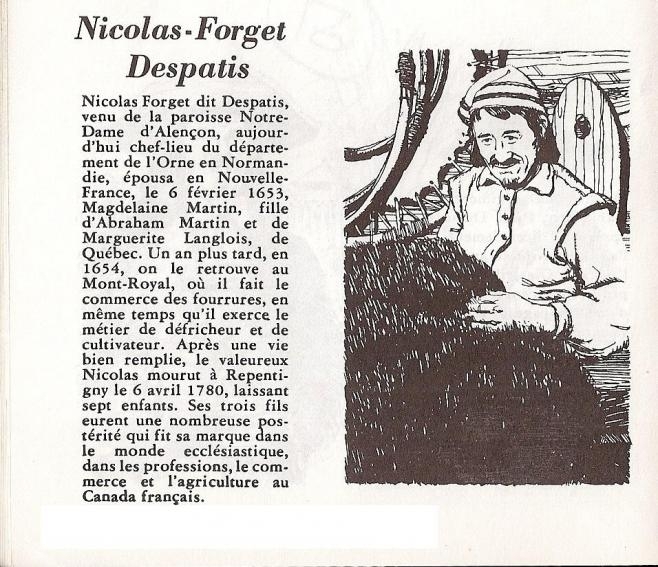 The marriage record below for Generation 1 – Nicolas – includes “dit Despatie” after Forget. Somewhat confusingly, some records I have located carry only Forget, while others carry Forget dit Despatie, and by the ninth generation, Forget is dropped altogether. Our line from the arrival of the first generation until my grandmother goes like this: Nicolas-Jean Baptiste-Michel-Michel-Michel-Louis-Antoine-Antoine-Emery-Loretta. Below are two maps that document the migration of our Forget-Despatie line, over 10 generations, from metropolitan Montreal, Quebec to Wauregan, Connecticut. Our direct line ancestors are highlighted below in red text. Nicolas married Madeleine Martin on February 3, 1653 in Quebec, Canada. Madeleine was the daughter of Abraham Martin “the Scotsman” (although most sources agree he was not likely from Scottish parentage) and Marguerite Langlois. The Plains of Abraham, where a famous battle between the French and English occurred in 1759 is named for Abraham Martin, who owned the land near the fields where the park now stands in the early years of New France. Many sources cite the friendship between Abraham and Samuel de Champlain, the “Father of New France” who likely gave Abraham the land. Jean-Baptiste, born about 1679 in Montreal, Quebec, married Jeanne Beaudoin. Jean-Baptiste was born around 1677 in Lachenaie, Quebec, and has the distinction of being the first of our line to be born in New France (Canada). 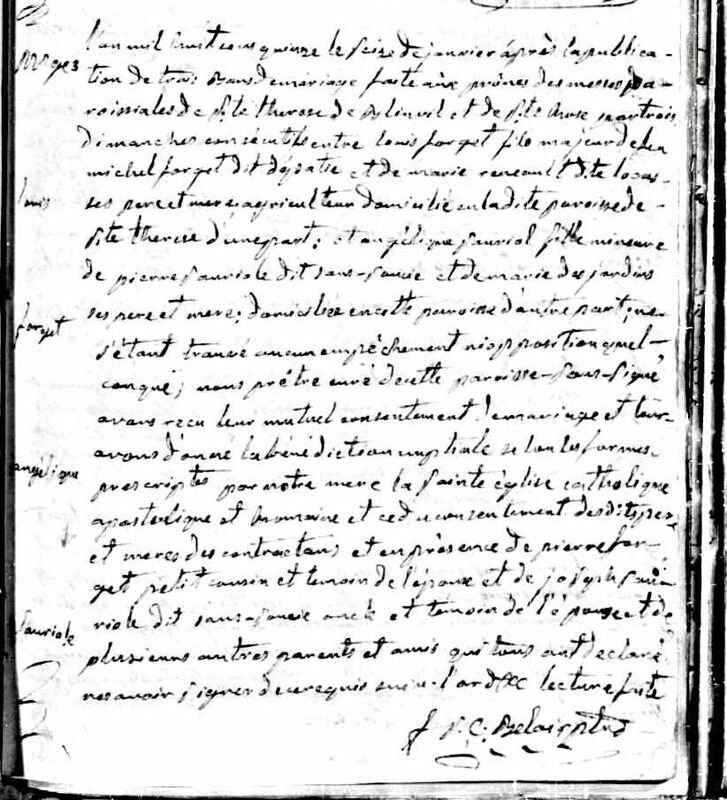 According to his wedding record, he married Jeanne Beaudoin in Lachenaie on November 22, 1700. Jeanne was the daughter of Jean Beaudoin and Charlotte Chauvin and was about 18 years old at the time of her marriage. Marie Catherine, born February 4, 1727 in Montreal, Quebec. Much like the case of his father, Nicolas, we have been unable to locate much information regarding the adult life of Jean-Baptiste. He died on August 13, 1733 in Lachenaie. Michel was born on March 29, 1705 in the Lachenaie suburb of Montreal. 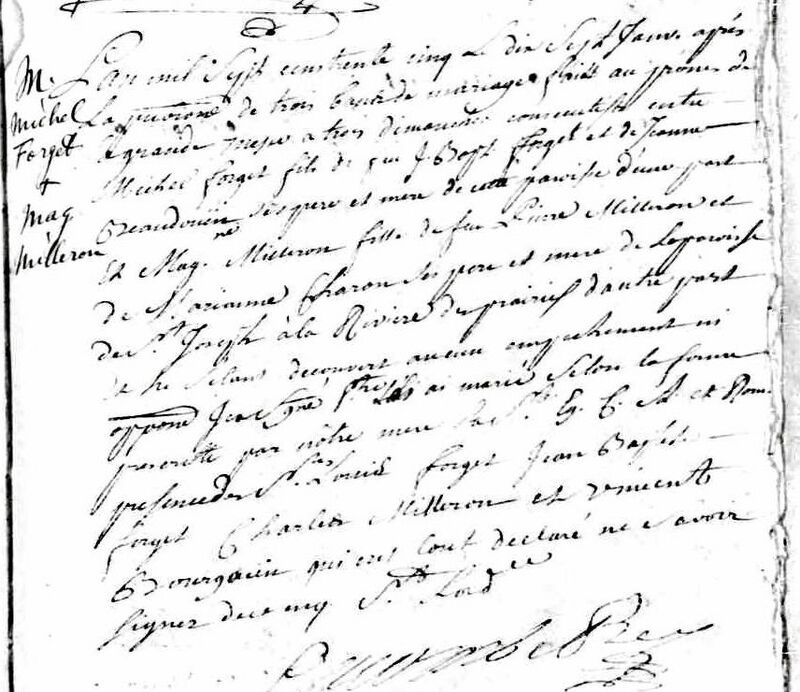 According to his wedding record, he married Marie-Madeleine Migneron on January 17, 1735 in Lachenaie. Marie-Madeleine was the daughter of Pierre Migneron and Marie-Anne Charron. Marie-Josephe, born April 1, 1751 in Montreal Quebec. A death record for Michel has not been located. Michel II was born on March 29, 1737 in the Lachenaie suburb of Montreal. 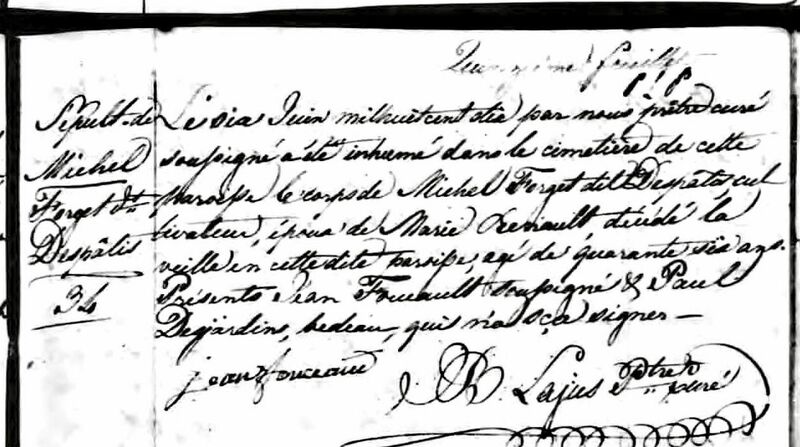 According to his wedding record, he married Angelique Berloin-Nantel on July 13, 1762 in Terrebonne. Angelique was the daughter of Jean-Baptiste Berloin Nantel and Francoise Renaud. Antoine, born April 18, 1778 in Montreal, Quebec, married Marie Labonge. Michel died on September 8, 1816 in Terrebone, Quebec. Antoine, born November 21, 1799 in Montreal, Quebec, married Marie Marguerite Desroches. Michel died on June 5, 1810 in St. Therese, Quebec. Louis was born in 1791 in the St. Therese suburb of Montreal. 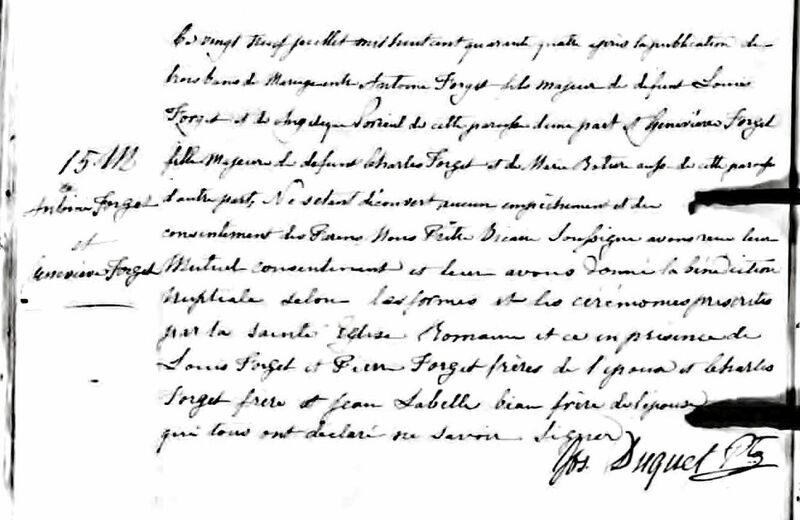 According to his wedding record, he married Angelique Sauriol-Sansoucy on Jan 15, 1815 in St. Rose, Ile Jesus, Quebec. Angelique was the daughter of Pierre Sauriol-Sansoucy and Marie-Angelique Desjardins. Jean, born March 26, 1831 in Montreal, Quebec. Louis died on October 11, 1832 in St. Therese, Montreal at the young age of 41, although a death record has not been located. Antoine was born on April 8, 1822 in Ste-Therese, Montreal. 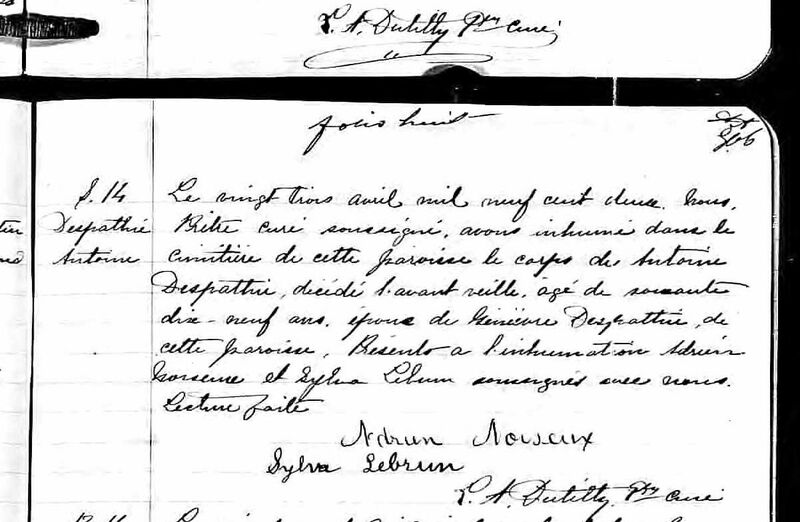 According to his wedding record, he married Genevieve Forget in St. Therese on July 29, 1844. Genevieve was the daughter of Charles Forget and Marie Belisle. Antoine and Genevieve were 3rd cousins, once removed: they share direct common ancestors in Jean-Baptiste Forget and Jeanne Beaudoin, who were Antoine’s GG grandparents and Genevieve’s GGG grandparents. Emerie, born about 1867 in Roxton Pond, Quebec, married Virginia Cote. 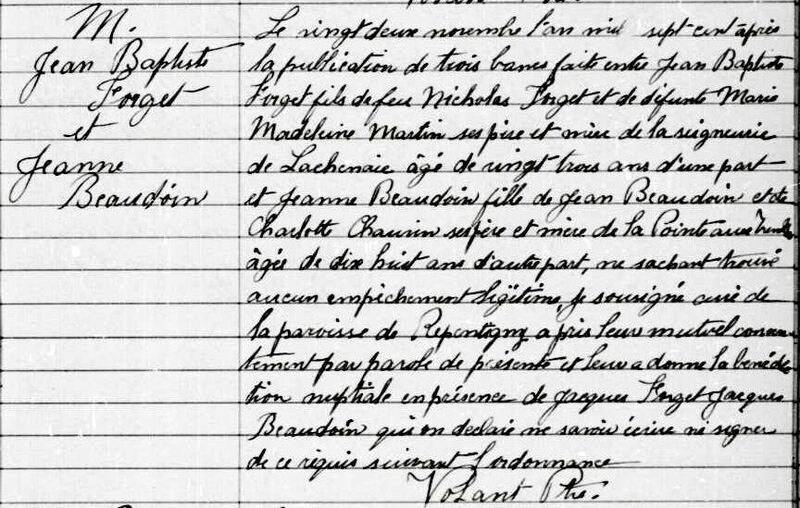 Antoine and Genevieve appear together in the 1861 Census of Canada, living in Shefford, Quebec (about half way between Montreal and Sherbrooke) with several of their children. They also appear in the 1871 and 1881 Censuses of Canada. In each census he is listed as being a farmer. According to his death record, Antoine died on April 23, 1902 in Roxton Pond. So far, no death record has been located for Genevieve. Antoine II was born on June 6, 1845 in St. Therese, Montreal. Antoine was the last of our line to be born in the city of Montreal. According to his wedding record, he married Celina Plouf in Ste. Cecile Milton on July 29, 1869. Celina was the daughter of Pierre Plouffe and Therese Henau. Theoline Leonie, born September 14, 1884 in Granby, Quebec, married Joseph Lebeau. 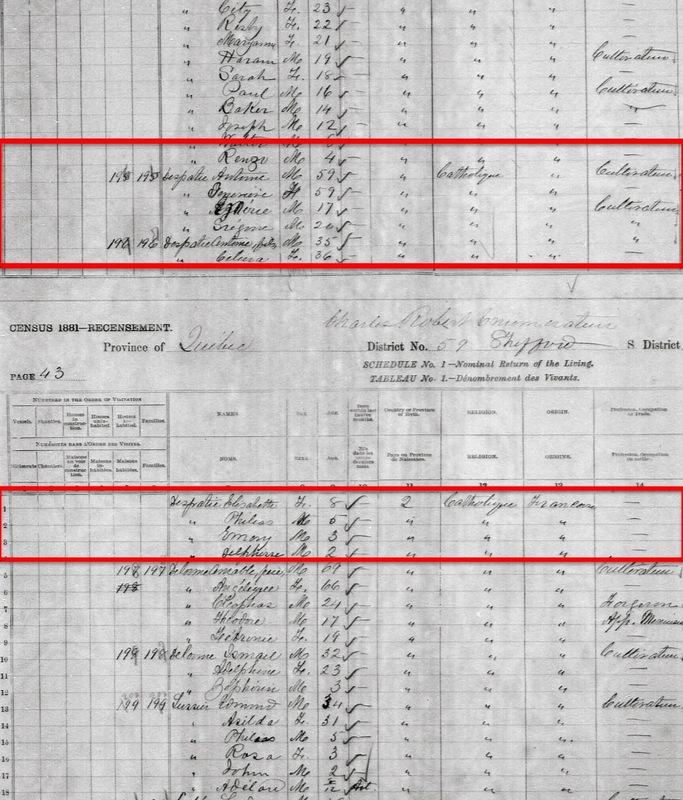 Antoine, Celina, and three children appear in the 1881 Canadian Census. The family is living in Granby, Quebec, where Antoine worked as a farmer. Although we have not located an exact date, Antoine likely moved from Canada to the United States between 1890 and 1893, becoming the first of our Forget-Despatie line to move permanently to the United States. This is based on the fact that he does not appear in the 1891 Canadian Census and because his wife Celina died in Wauregan, Connecticut on February 15, 1893. 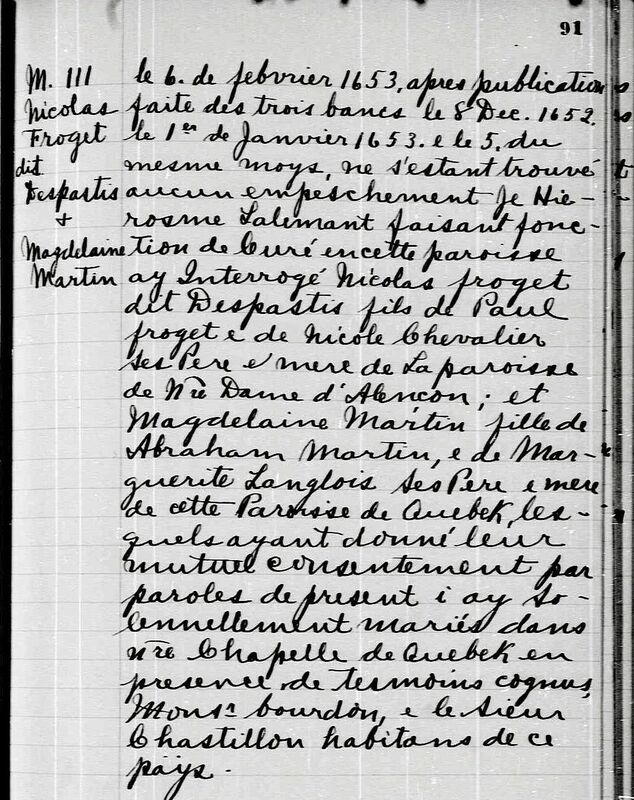 On January 9, 1899, Antoine married Josephine Flibotte in Ville Ste. Pie, Quebec. 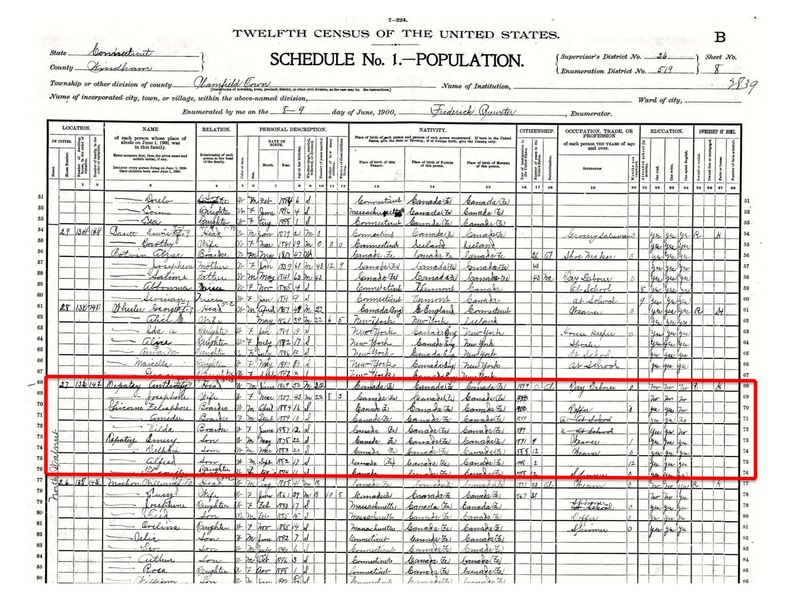 In the 1900 US Census, Antoine and Josephine were living in Plainfield, Connecticut, where Antoine worked as a day laborer. Plainfield drew a large number of Canadian immigrants (largely from Quebec) in the early 1900s because of the availability of jobs in the textile mills. In the 1910 US Census, Antoine and Josephine are listed as living in Plainfield, where Antoine worked as a day laborer at the cotton mill. Antoine died in Plainfield on January 19, 1920 and is buried at the Sacred Heart Church Cemetery in Brooklyn, Connecticut. Emery was born in Granby, Quebec on December 21, 1877. 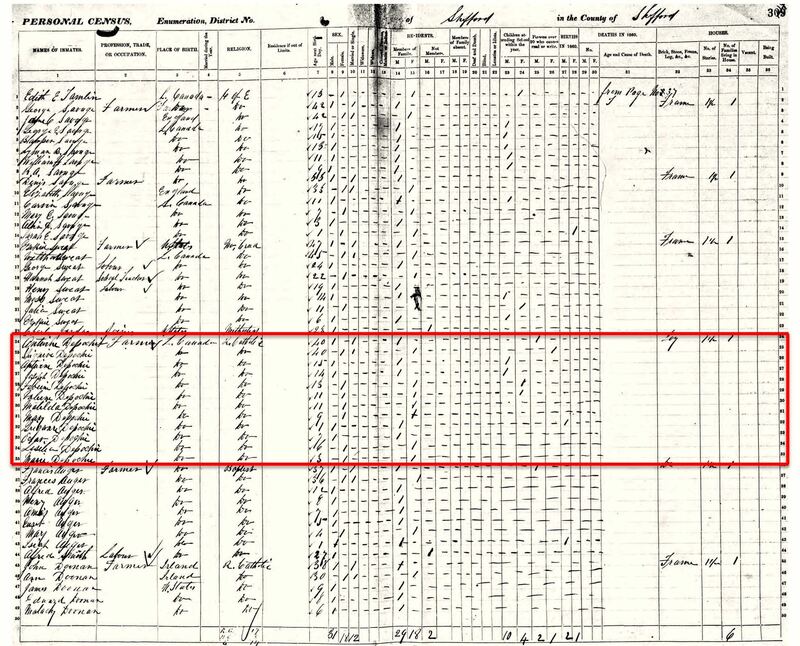 In the 1881 Canadian Census (see above), Emery is listed living with his parents, Antoine and Celina, in Ste. Cecile Milton near Roxton Pond. He is presumed to have moved from Canada to the United States with his parents between 1890-1893. 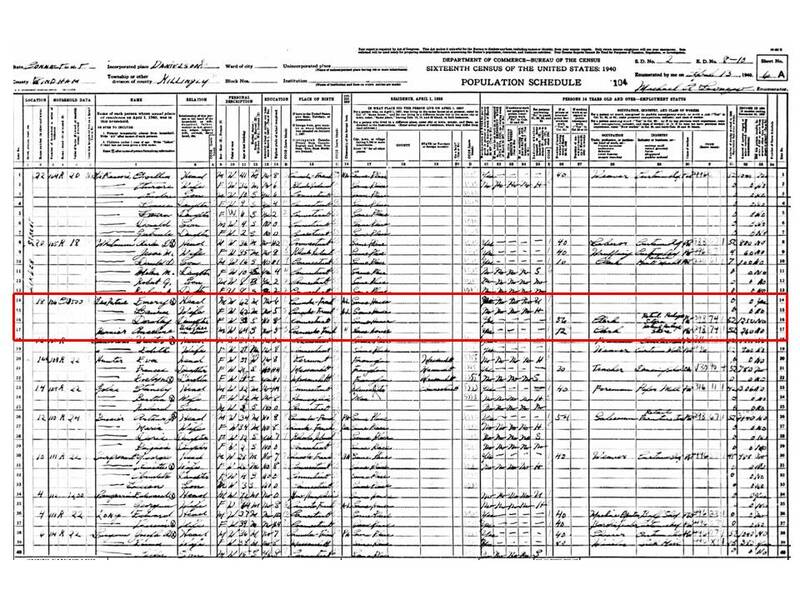 In the 1900 US Census (see above), Emery was living with his father Antoine and several siblings at 27 N. Walnut Street in Plainfield, Connecticut, where he worked as a weaver. On February 27, 1905, Emery married Marie Leonide Laura Bernier in Granby, Canada. Laura was the daughter of Julien Bernier and Hermine Ravenelle. Loretta Ida, born June 3, 1913 in Wauregan, Connecticut, married Shirley Greene. In the 1910 US Census, Emery, wife Laura, children Dorothy and Antonio, and 25-year old sister Leonie Tonille were living in Plainfield (Wauregan Village) on N. Walnut Street. Emery worked as a weaver at the cotton mill. On September 12, 1918, Emery registered for the World War I draft in Willimantic, Connecticut. The draft registration card (at right) denotes that Emery was a declared alien from Canada, was of medium height and build, and had gray eyes and gray hair. 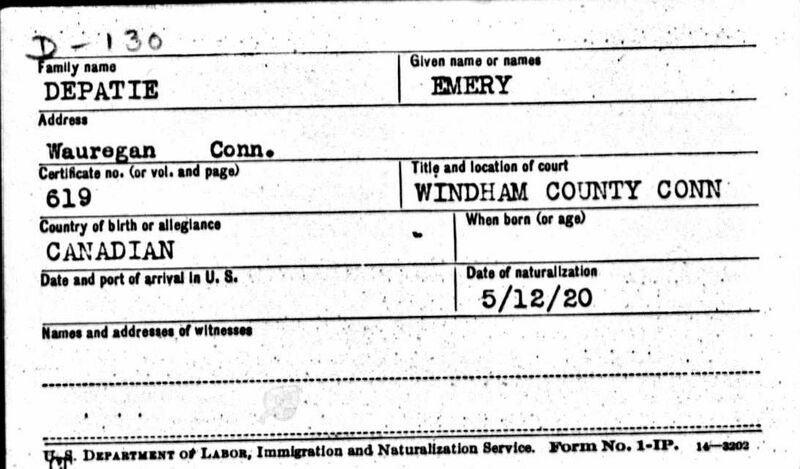 On May 12, 1920, at the age of 43 (and after having lived in the United States for some 30 years, Emery became a U.S. citizen. In both the 1920 US Census and in the 1921 Danielson City Directory, Emery and family still lived in Plainfield (Wauregan Village) on 11 N. Walnut Street, and Emery continued to work as a weaver at the cotton mill. 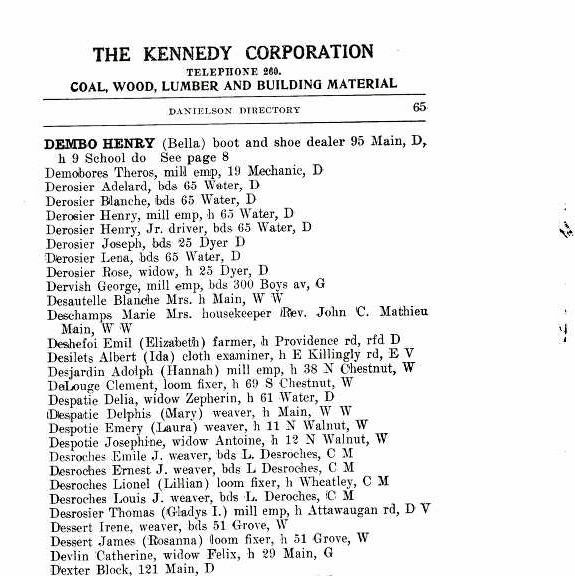 In the 1927 and 1928 Danielson City Directories, Emery is listed as working as a weaver and living with wife Laura, son Antonio, and daughter Dorothy at 4 Griffiths. In the 1930 US Census, Emery and family lived in Killingly (Danielson borough), where Emery worked as a curtain maker at the cotton mill. His son Antonio worked as a taxi driver, and his three daughters were also curtain makers at the cotton mill. 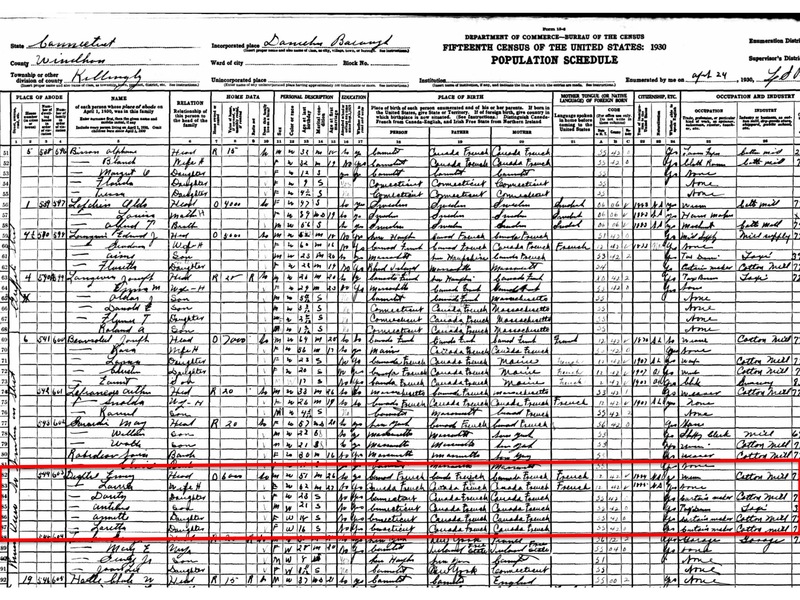 By the time of the 1940 US Census, Emery appears to have retired from working in the mill. Of his children, only Dorothy remained living in the house, and she was employed as a clerk for a retail store. Of note, Laura’s brother Anselme Bernier was living with the family and also worked as a clerk at the retail store. Laura died on February 18, 1948 in Wauregan. Following her death, Emery was listed in the 1948 and 1954 Danielson City Directories living at 18 Leander Street. Emery died on October 19, 1956 in Killingly, Connecticut, although a death record has not yet been located. He is buried at the Sacred Heart Church Cemetery in Brooklyn, Connecticut. His gravestone inscription reads s/o Antoine & Celina (Plouffe). 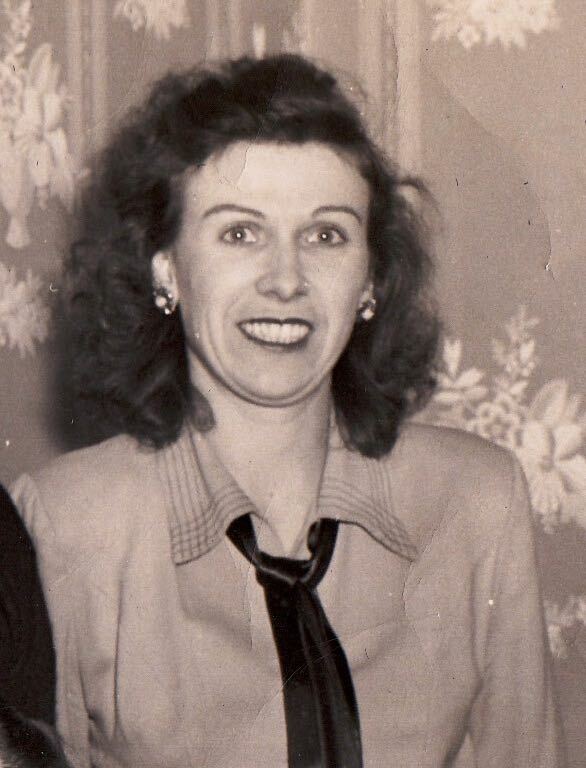 Loretta was born on June 3, 1913 in Wauregan, Connecticut. She is the first of our Forget-Despatie line to be born in the United States and was the youngest of four children. As the child of Québécois people, Loretta and her siblings were raised speaking French at home and learned English in school. As such, Loretta was entirely bilingual. Loretta attended school up to early high school, but left around the age of 15/16 to work in the mills. In the 1930 census, she is listed as being employed as a curtain maker in the cotton mill. 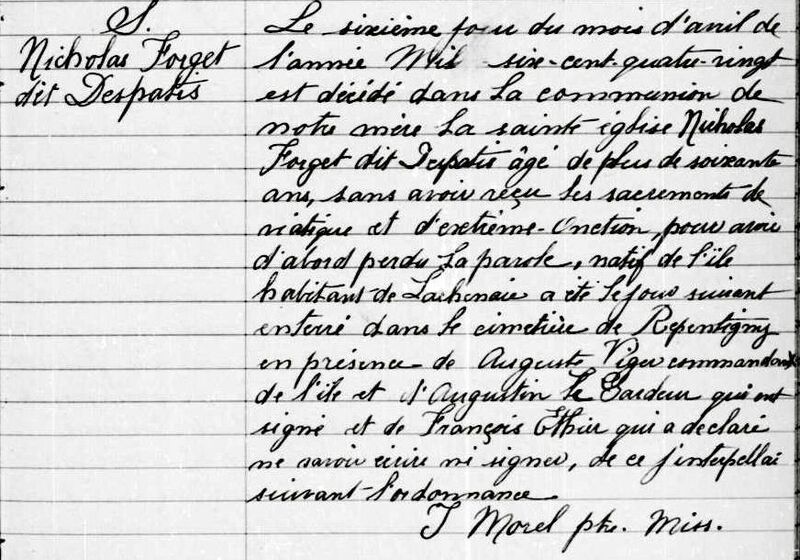 Would anyone have any idea about Adele Despatie married to Charles Trefle Jolicoeur in Notre Dame de La Salette? Hi Joanne, unfortunately I don’t recognize those names as being in our line. Sorry I couldn’t help, but good luck in your research! Hi Joan did not know you were interested in the line of our great grand-mother for me…taking your aunts place…did you get any answers…..
Hi …Thank you so much for putting together this wonderful family history. 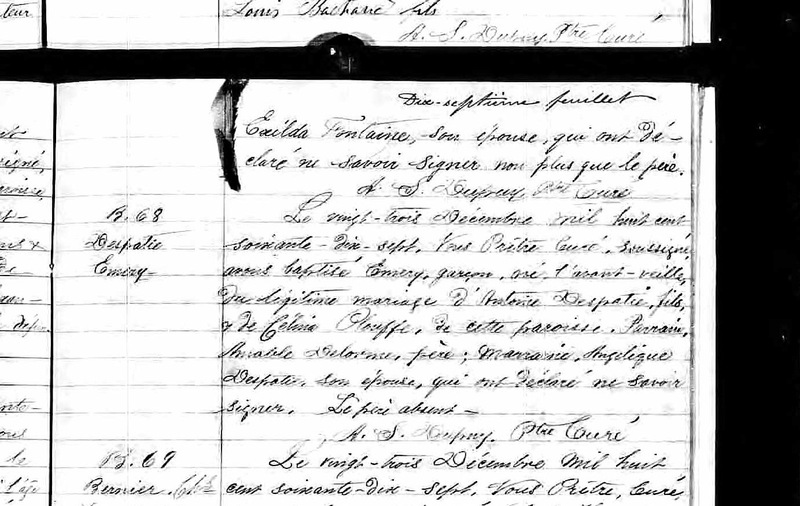 The brother of your Ancestor, Antoine is my Great, Great Grandfather, Gregoire born in Roxton Pond, Quebec on June 6, 1860, son of Antoine Forget (Dit Despatie) and Genevieve Forget. I believe his son, George Wilfred Despathy (my Great Grandfather) was the first child born in the U.S. They initially settled in Baltic, Ct. My Grandfather Wilfred George Despathy move to Moosup where he lived until his death in the 1970s. My Grandfather, George Despathy, started The Despathy Furniture Store in Moosup. My name is Patricia Fortier Benjamin…My mother was Norma Despathy, daughter of Wilfred George and Rose Larivierre. Oops. a little correction….My Grandfather Wilfred George Despathy was the first ancestor in our branch of the family to be born in the United States. 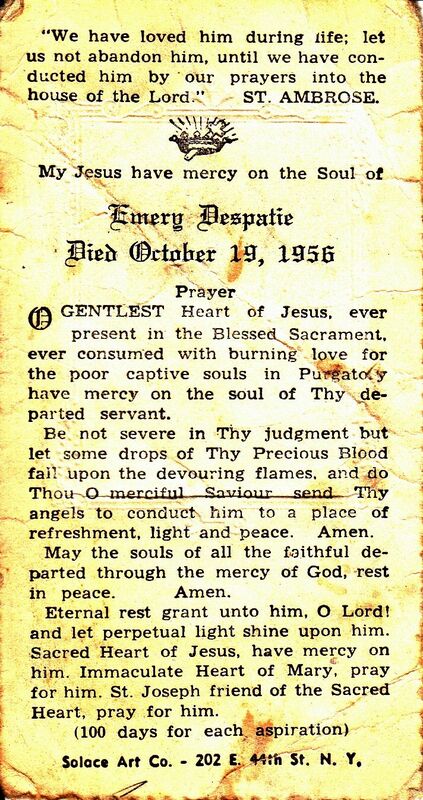 My Great Grandfather, George Wilfred was the first generation to drop the “Forget” and change the Despatie to Despathy. So, I am a 3rd generation American on my mother’s side and a second generation American on my father’s side. I found your website by accident but am very happy to see this current interest in the Despatie family. We have worked very hard on this for many years but at our age travel is no longer possible. 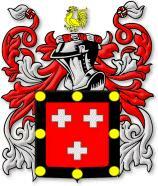 My father was Wilfred Joseph Despathy who lived in Moosup along with his brothers and sister. My sister still resides in Moosup but we are now in AZ. There is a world famous DePatie: David Hudson DePatie, the creator of the Pink Panther! Ha! I didn’t know that, thanks for sharing! I remember seeing the name in the critics…was always so curious about his roots…thanks! I just saw this and am so amazed as to how everything can come together. Still, no names look familiar but maybe in time. My grandfather was Edmond Depatie, and his father Pierre Depatie. Perhaps, the Adele your looking for was the sister of my Mothers Father Edmond Despatie (Depatie) from the Sudbury Ontario Canada area. Edmond was the son of Pierre Despatie his wife was Marceline Gagnon from Chellierville Quebec. She was born May 11, 1884 i believe. How you managed to get all this genealogy if impressive. I have been searching hi and low for ANY information on my mother’s side – my grandmother was Éméa Despatie, daughter of Pierre Despatie and Marceline Gagnon (looks like we’re distant cousins). I too have been looking for the aboriginal ancestry that my grandmother often talked about. Do you have any info on that? I always end up on a dead end. Hi Lyne, thanks for your kind words! I’m also at a brick wall on any aboriginal ancestry. I wish I had a stronger command of French. Let’s stay in touch in case we make any inroads. Absolutely! If I come up with anything, I’ll let you know. Hello, I am also searching this line, my maternal line…i have some info and know some aboriginal ancestry is present but can’t prove it. Rosa Mathias was born in the states and not Quebec, same with her brother Arthur. the lines vary from Jolicoeur to Mathias and Mathias have aboriginal ancestry also; check census under Manawaki, Quebec. Suspect that we need to look at two different family lines and not just one who changes names. Just as confused, Lily. Joseph Godard on September 4 1939 in Cyrville. My brother Gilles (1959) married Lise Ladouceur. I want to continue the Despati/Jolicoeur ancestry for my four grandchildren. Please bare with me any information you may have. It will be greatly appreciated.